This past weekend at the Baltimore Comic-Con, the annual Harvey Awards were given out, honoring excellence in the comic book industry. Hosted by Bill Willingham, the Harvey Awards featured such celebrity presenters as Neal Adams, Stan Sakai, Joe Hill and many others. Image Comics was represented at the Harveys with nominations for SKULLKICKERS, REVIVAL and SAGA. As the awards were given out, it was clear that the night would belong to SAGA. Image Comics would like to congratulate all of the nominees and winners of the 2013 Harvey Awards, and would like to especially congratulate Brian K. Vaughan and Fiona Staples. 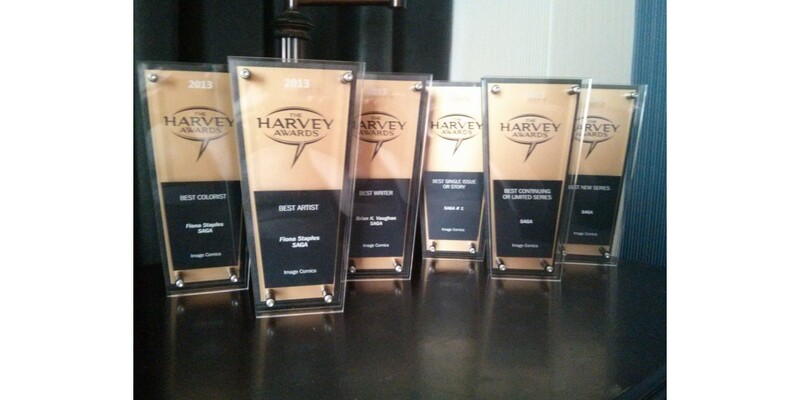 Everyone at Image, along with Brian K. Vaughan and Fiona Staples would like to thank the fans, comics professionals and retailers who voted for the Harvey Awards.